Here at BerryRipe, we’ve always been committed to providing the best vegetarian and vegan recipes of our own. But the fact of the matter is that this is a big world and there are way too many vegetarian blogs out there that go unnoticed. That’s why we’ve compiled a list of the Top 50 Vegetarian Blogs of 2013. These are the vegetarian blogs every vegetarian should keep an eye on in order to discover the healthiest, most modern, tastiest, or most unique vegetarian recipes and information from around the world. 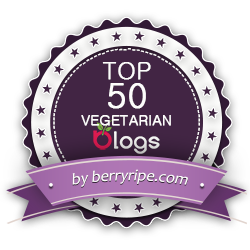 Let’s get to list of the Top 50 Vegetarian Blogs of 2013! This list is not in any particular order and will rotate occasionally so that some vegetarian blogs aren’t always listed as the bottom. Well, there they are! The Top 50 Vegetarian Blogs of 2013. We hope you found some great vegetarian information along with some dazzling vegetarian recipes to make for yourself and your family. Wow! What an amazing list of blogs! Mouth watering! This has made me want to start integrating some more vegetarian dishes into my cooking routine! I love how you have compiled these sites all into one location. Makes it super easy to stroll and look around to find some really great recipes. Thanks! OOHHHH my hubby is gonna love this post! A new veg. in the making! Congrats! Thanks for all these new sites to check out. I’d like to eat more vegetarian. wow, didn’t even know there were that many veggie blogs out there! I’ll definitely have to check them out. What a great list of vegetarian blogs. I pinned it for future reference! I’m not a vegetarian, but sometimes I need to find recipes that can accommodate a mixed crowd at parties. This is a great resource! I need to look at all of these. I want to start doing some more vegetarian eating in my house. Those look good. I would be a vegetarian if I could eat meat in addition to the veggies. Thank you for this list of bloggers. I’ll have to check them out as I have time. Of course, I love my meat, but vegetables too. Great list! I’m excited to find some new food inspirations! What a great selection of sites! I’m totally pinning this and coming back to look at some of these! Congrats to all the winners now please excuse me while I raid the fridge. What a great list! I’m not a vegetarian, but my family would like to reduce our meat intake so I’m sure I’ll be able to find some great recipes and resources on these sites. Those all look very interesting. I bookmarked many of them to go back and look. I am not 100% vegetarian (sorry, love me a BIG FAT steak or JUICY burger) I am about 80% of the time. I like to see new recipes and food ideas though! Thank you so much for featuring me and Culinary Karma! Humbly honored :)) this is a great list and resource!! Sending love and light. Great list! Pinning these for later so I can check them all out.